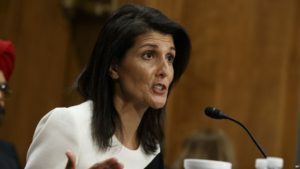 The US ambassador to the United Nations on Thursday called for a “full investigation” into the death of two UN experts killed in March in the Democratic Republic of Congo. Michael Sharp of the United States and Zaida Catalan, a dual national of Sweden and Chile, disappeared on March 12 and their bodies were discovered in shallow graves on March 27. A United Nations board of inquiry said the two experts were likely murdered by militiamen from DRC’s violence-torn Kasai region. “The murder of UN experts – especially like Michael and Zaida, who risked their own lives in order to help others – cannot end in a bureaucratic procedure,” said US Ambassador Nikki Haley. “We still need a full investigation under the Secretary-General’s authority into the events surrounding their deaths and accountability for the perpetrators – there is simply no other appropriate course of action,” Haley said in a written statement. Sweden also joined the US, Britain, France and Japan to support UN Secretary-General Antonio Guterres in launching an international follow-up inquiry to establish criminal responsibility. There are already ongoing criminal investigations in Sweden, the DRC and the United States. “The UN’s board of inquiry is not enough. The work is not finished as long as the perpetrators walk free. Further UN action is needed in support of the ongoing national criminal investigations in Sweden, the US and the DRC,” said Swedish Foreign Minister Margot Wallström in a statement. The Kasai region has seen a major spike in violence since September when government forces killed tribal chief and militia leader Kamwina Nsapu who had rebelled against President Joseph Kabila. The unrest has claimed more than 400 lives and forced more than 1.2 million out of their homes. Posted by Khalid Al Mouahidi on August 18, 2017. Filed under News. You can follow any responses to this entry through the RSS 2.0. You can skip to the end and leave a response. Pinging is currently not allowed.